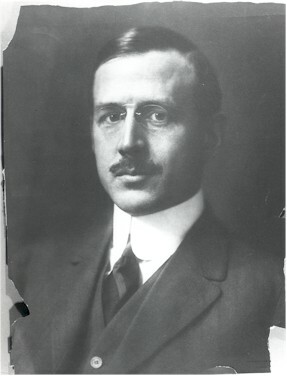 Gano Dunn, AIEE President, 1911 - 1912, became president of the J. G. White Engineering Corporation in 1913. Included among the company’s projects were the United States Naval Oil Base at Pearl Harbor, 13 transoceanic radio stations, and the first long-distance natural gas pipeline in California. Gano Dunn was born in New York, NY, 18 October 1870. Dunn’s father died before his son finished his education. Dunn therefore began professional work 1886, in the service of the Western Union Telegraph Company, where he remained for 5 years. While working, he received a B.S. degree from the College of the City of New York in 1889, and two years later had the distinction of receiving the first degree in electrical engineering awarded in the United States from Columbia University. He then entered the service of the Crocker-Wheeler Company at Ampere, NJ, where he stayed until 1911, as a vice-president and chief engineer. In 1911 Dunn joined J. G. White Engineering Corporation, New York, as vice-president in charge of engineering and construction. Two years later he was elected to the presidency of the company, which became one of the most prominent construction firms in the world. Among the company's projects were the United States Naval Oil Base at Pearl Harbor, the steam plant at Muscle Shoals, Alabama, 13 transoceanic radio stations, the original Government aviation station at Langley Field, Virginia, and the first long-distance natural gas pipe line in California, as well as completing programs on roads, oil, and irrigation in Latin America. Dunn had a lifelong interest in education. He was a trustee and former president of Cooper Union for Advancement of Science and Arts. In that capacity, he actively put forth his view that engineers needed education in not only the sciences, but also in the arts and humanities, in order to become fully-developed persons, able to make use of their talents. He was also a trustee at Barnard College, and a member of the visiting committee of Harvard Engineering School. Dunn also served his profession in other ways. He served as AIEE president from 1911 to 1912. He was elected to the board of directors of the Radio Corporation of America in 1938 and acted as a member of the Roosevelt's Science Advisory Board. Among the many awards presented to Dunn were the Townsend Harris Medal of the College of the City of New York, the Egleston Medal of Columbia University, the Hoover Medal of the National Engineering Societies (1939), the Modern Pioneer Award of the National Association of Manufacturers, and the Peter Cooper Medal of the Cooper Union. In 1937 he received the AIEE Edison Medal "For distinguished contributions in extending the science and art of electrical engineering, in the administration of great engineer works, and for inspiring leadership in the profession." Dunn also received honorary degrees of doctor of science from Columbia University, Rutgers University, and New York University. He was a Fellow of the Institute of Radio Engineers, the Royal Microscopy Society, and the New York Academy of Sciences. He was married to the former Julia Gardiner Gayley from 1920 until her death in 1937. He died on 10 April 1953. A group of past presidents at the AIEE Chicago Convention, June 29, 1911. Photo appears on page 1773 of the 50th Anniversary special issue of "Electrical Engineering." Back row (l-r) Gano Dunn, Dugald C. Jackson, Louis A. Ferguson, Schulyer S. Wheeler, John W. Lied, and Bion J. Arnold. Front row (l-r) Francis C. Crocker, T. Commeford Martin, Frank J. Sprague and Charles P. Steinmetz. This page was last edited on 14 February 2019, at 16:21.